According to the images, Safari Reader will allow users to "click on the new Reader icon to view articles on the web in a single, clutter-free page." If this turns out to be true, it will be interesting to see what exactly a single, clutter-free page means to Apple. iAd anyone? 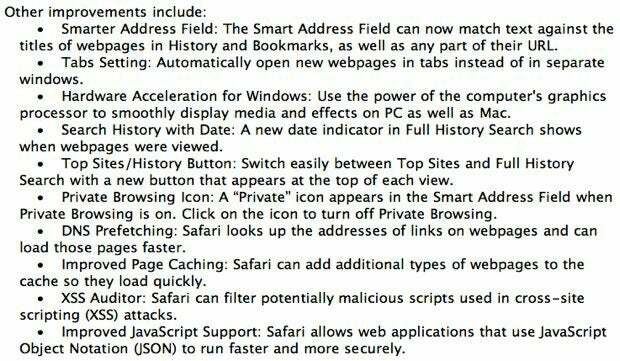 The new version of Safari will also supposedly pack improved support for HTML5, including features such as geolocation, full-screen HTML5 video, and closed captions for HTML5 video, to name a few. MacGeneration didn't stop with Safari 5; it reports that Mac OS X 10.6.4 was internally distributed and the server version has "passed to the status of Gold." Sure, images of support documents are easy to forge -- they're just photos of text, after all -- but there could be some merit to these screens, or at least to the likelihood that Apple could release Safari 5 to coincide with WWDC. That was the game last year.